I am always amazed at how much good music is out there just waiting to be discovered. 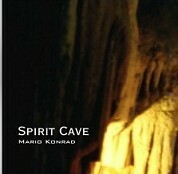 Mario Konrad's CD Spirit Cave arrived a couple of weeks ago and it has been in and out of my CD player ever since. I get quite a bit of music here at AV and I try to give most of it at least a cursory play through to get an initial impression. Quite often this will end up being the only play through for some releases that I receive as it just doesn't strike a responsive chord with my own music sensibilities. That is not saying that it is necessarily bad music it is just that I am not the one to write a review of it because I wouldn't have anything good to say about it.Spirit Cave went through that first listen and hooked me right away. A combination of atmospherics and tribal rhythms featuring hand played drums and percussion elements is just a perfect combination on this CD. There are a total of 6 tracks on this CD with the shortest being almost 6 minutes in length. The longest clocking in at 13:52 which as you might suspect allows the artist to develop each song fully and explore the nuances of each theme. The great thing about this CD is the blending of the almost ethereal space music in the background that serves as a backdrop for the tribal elements that are front and center. You might think that these elements would clash with one another but Mario shows his skill as a musician by weaving these opposites into a cohesive whole that is greater than the sum of its individual parts. One of my favorite pieces is right up front on track number 1 and it is called Some Distant Shadows. This track sets the mood for what will follow and hands the listener a road map of where they are going in the journey they have just begun. The drumming is hypnotic and trance like in many places but the space elements offer up a changing palette upon which the drumming rests and keeps the listener's interest even on the longer pieces on this CD. At a higher volume it would be perfect for losing oneself in the moderately quick paced rhythms or at lower volumes it would make for a nice backdrop for reading or meditation. 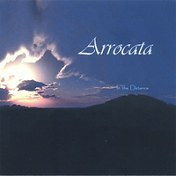 Track 4 entitled A Ritual Ceremony offers up some interesting variations on the main theme of this CD by including a chanting kind of voice that drifts and fades into and out of the spotlight. While the words are not intelligible they offer a perfect "feel" for a song called A Ritual Ceremony. This song also brings up the background synths to a more prominent position within the song. I must admit that I liked all six of the songs on this CD and even after repeated listenings over the past couple of weeks I have found the music to be engaging and never repetitious. German artist Mario Konrad delivers up a marvelous CD inSpirit Cave that is well worth the effort to locate and obtain a copy for yourself. If you enjoy tribal music and are not afraid of adding a little beat to your musical menu then this CD should be in your player as well. This is the first release from the recently formed Frequency Lab label and if this is any indication of the quality of music that we can expect from this label I will be eagerly looking forward to future releases from them. Great job Mario. AV recommended CD. Frederic Delarue is establishing himself as one of the foremost composers of so-called new age music, and is one of a few whose CDs are always interesting, soothing, and compelling. Delarue�s albums have basic themes, and previous releases have been about the magic of dolphins, classical composers �coming to play with Delarue,� spiritual voyages, etc. The common threads are consistently superior music, an uplifting spirit, and the statement that the music was created with guidance of Delarue�s angels and �beings of light.� (It is well worth a visit to www.fredericdelarue.com to read his amazing biography.). The subtitle of this latest release, �Dream Your Life, Live Your Dreams,� sums up the thematic material, and there is a dreamy, graceful quality from start to finish. Delarue writes in the liner notes: �I invite you to reflect on the events of your life and surrender them to peace & love and bring forgiveness to yourself and anyone involved.� Can a collection of eleven original pieces of music accomplish all of that? When it comes to Delarue, I think it�s possible. None of the tracks are solo piano, but they are all piano-based with keyboard orchestrations. It is interesting to note that in the liner notes, the track titles are formatted in such a way that they create a short, evocative poem. The opening track, �I Feel,� conveys the deep sense of spiritual contentment and connectedness that come too rarely in our rushed and over-scheduled lives. Listening to it, I can feel my breathing slow and go deeper, and the sense of urgency that has been plaguing me of late starts to melt away. �Beneath the Footprints of My Sole� has the feeling of gently floating in vast open space that Delarue does so well. The effortless flowing broken chords on the piano are hypnotic as the more ambient background coaxes you to a dreamy state of mind. Passionate as well as soothing, this is an exceptionally beautiful piece. �Caress My Spirit� begins with ambient voices that reverberate in a large space - perhaps a cathedral or even a castle. About a third of the way through, the piano enters with a much lighter melody. The piece melts into �With Tender Passion,� with its floating vocals and air of mysterious calm, supplemented with flute and subtle keyboard effects to gorgeous effect. �Beyond Eternity� lightens the mood quite a bit with a warm and graceful waltz. �I Remember� incorporates the simple melody of the Pachelbel Canon with strings and piano. It isn�t an exact rendering of the piece, but certainly suggests it. �The Power of Silence� becomes much more thoughtful and reflective - almost dreamlike, with shimmering strings and a quietly pensive piano. �I Am Free� closes the album with a bittersweet and passionate waltz that tugs at the heartstrings. What a lovely ending for another great album from Frederic Delarue! That I now want to get out his previous CDs and listen to them again says a lot. 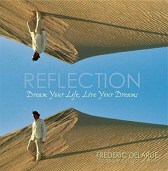 �Reflection� and Frederic Delarue�s other CDs can be purchased at www.fredericdelarue.com and amazon.com. Highly recommended! 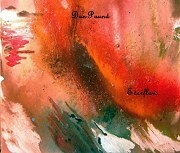 Another recent self-released album by Dan Pound is Everflow. It's got a similar style to Solar Nexus in terms of instrumentation and the shamanistic feel but is less intense � hallucinogenic-lite is perhaps one way of describing it! The commissioned covert art for this release doesn't provide an answer to the mystery of the music, so this is a CD that can't be judged by its cover. In the first track �Taking Flight� we encounter Dan's typical music elements of rippling sequences, didgeridoo, shamanistic voices, electronics, flutes, singing bowls etc. The conglomeration of these sounds results in an kaleidoscopic effect that verges on the primeval. Just this aspect of Dan's work would be enough to make his work interesting, but it's also enjoyable - and even mesmeric in places. For pure enjoyment my favourite piece has to be �Hand in Hand�. Melodic and subdued clattering begins the piece and is joined by a simple melodic rhythm on what I think is acoustic guitar. The rhythm then picks up with bass and percussion while half voice-half flutey refrains add an air of mystery. It's up to the listener to decide who he's walking hand-in-hand with. Rhythm is a strong element throughout the album, yet some pieces are mainly based on atmospherics. This is most apparent in �Remembering the Dream� where fat airy drones undulate across the soundscape like waves of subconscious thought while a slow tribal rhythm fills out the backdrop. Snippets of half-discerned effects continually intrude in the distance and throaty didgeridoo and flutes add more obvious sonic interest. Along with the electronics there's an earthy, organic quality that permeates Everflow making it shamanistic music for the 21st century. For anyone looking for something different than run of the mill new age or world music this is an album well worth checking out. �Eden� is a very impressive debut by K. Ryan Brown. Will Ackerman agreed to produce the recording at his Imaginary Road Studios based on a rough demo, and started working with Ryan at the ripe old age of 16. Unlike many of Ackerman�s recent piano productions, Ryan�s is all solo acoustic piano. The overall tone of the album is quietly somber, but the music is full of deep emotional intensity and has a maturity that belies Ryan�s young age. The pieces are a bit abstract and more ambient than melodic, but his expressive playing communicates beautifully. It is very possible that Ryan Brown will become an important voice in contemporary piano - he is certainly off to a promising start! The title track begins the album. This piece has a real sparkle about it that suggests a sense of wonder and beauty. My favorite track is �Stonebridge,� a piece where Ryan often uses the damper pedal to create the feeling of vast space. Too much pedal can drive me up the wall, but he has used it to great effect here. The dark mood of the piece feels like a soliloquy to me, full of passion and introspection. �Hidden Rooms� has a sense of mystery and a feeling of seeking something just out of view. �TiI Then� is a gentle farewell to a loved one, a little bit shy and bittersweet. �Where the Ocean Meets the Earth� conveys the majesty of the ocean as its waves flow over the shoreline or crash against the cliffs. The sparkle of light dancing on the water and the rhythm of the ebb and flow of the waves are very effectively portrayed. �Lovers� Quarrel� is very dark and turbulent - almost Russian in its intensity. The title �Dancing Turtles� evokes an interesting and amusing image, and the piece has a slow pace that is kind of heavy and somewhat ungraceful - very enjoyable! �On Comes the Night� is another beauty with an unhurried tempo. As the piece progresses, it feels like looking up at a vast night sky as the darkness descends, watching the stars becoming brighter and more intense and listening to the quiet. The pace becomes even slower at the end and just trails off, perhaps suggesting sleep - another really great piece! K. Ryan Brown should be able to make a real impact on the music world - especially with someone with Will Ackerman�s clout in his corner. Be sure to check out what this young man has to say via the piano! �Eden� can be purchased and samples are available at www.kryanbrown.com and cdbaby.com. Composer Robert Straub is the man behind the name Arrocata and his latest album In the Distance is inspired by, and evocative of, the Sonoran desert. By combining electronic, acoustic, and what are either environmental or faux environmental sound effects, he's created a low key atmospheric work. For most of us who are unfamiliar with the Sonoran desert the liner notes helpfully contain some brief background on each of the tracks. Whereas some ambient albums feel like they're taking you on a journey, listening to In the Distance is more like staying in one place while soaking up the atmosphere and surroundings in detail. I've not encountered many albums that mix found sounds and subtle music in such an integral way; the nearest work with any similarity I can think of is OTI's Recollection. First up is �Superstitions� which refers to the superstition mountains that contain rock spires and canyons. Washes like insectile humming breeze in and out of the soundfield while a lone drum beat is heard every few seconds adding a hint of a tribal aura. Meanwhile sounds of life constantly tweet and twitter in the background. A sense of mystery pervades the album, as though the Earth's secrets are providing brief glimpses to the edges of human perception. Musically the peak is found on �The Dutchman� which begins with a snaking of drones possessing a suggestion of frisson, spooky washes, and occasional searing electronics that shatter the calm. A slow tinkling rhythm then kicks in to soon be joined by drum and bass effects. Several kinds of washes, some vocally tinged, whoosh to and fro adding to the somewhat hypnotic but also disquieting feeling. In the Distance is an absorbing ambient work where the music melds seamlessly with the environmental effects. Recommended.